Simply stated, hybrid utility clubs are a cross between a fairway wood and a long iron, with similarities to both. 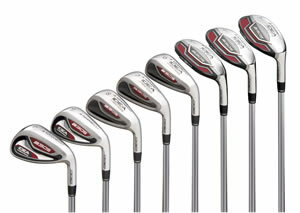 The terms “utility clubs” and“hybrid clubs” are generally used interchangeably. catching on like crazy and manufacturers are meeting the demand by specifically designing “sets”, so you do not have to do inordinate amounts of Internet research to find the set that works for you nor do piece-meal compilation of a set. Unquestionably, hybrids’ ease of use and versatility are without peer, and, not surprisingly, the numbers reflect pros’ increased interest in the clubs. How Do Hybrid Golf Clubs Work 101? allows it to stop faster with more accuracy. These hybrid golf clubs are mainly designed for distance control and accuracy. The shafts are shorter and the club faces stiffer like their iron counterparts. 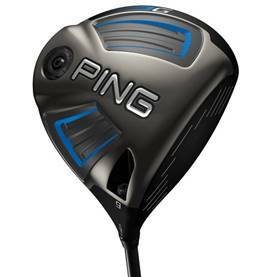 They also have no face bulge or roundness like fairway woods which keeps the shots simple. The bottoms often have runners or rails that help the club interact positively with the turf, whether it is long rough, short fairway or sand. Their lofts also vary anywhere form 16° to the mid 26°. Firstly, find a club that is optically pleasing. This means that you must find one that looks good to you, visa vie, fits your eye. This is very important to build your confidence in that club. Secondly, the player must have a willingness to change. These clubs are different and you have to be OK with mixing and matching your set. They are not considered replacements; they just provide new club selections. Lastly, you will need a little time to convert to a new set of hybrids and you may still have the need to change a club, but generally speaking, these sets have been specifically designed to eliminate this issue. Stronger players generally prefer the neutral bias options with steel shafts. These deliver a lower trajectory with more control. Conversely, average to softer swingers will probably be drawn to the bias options, with graphite shafts, as this will increase height and distance. Some of the early entries into irons sets that match hybrids with more traditional irons simply replace the 3- and 4-irons with hybrids, then jump directly to the 5-iron through pitching wedge. That’s fine for some players. 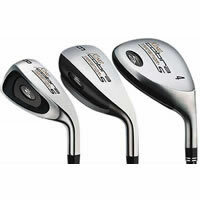 But there are a lot of golfers with slower swing speeds that find even getting a game improvement 5- or 6-iron up in the air an inconsistent proposition.Wilson FYbrid Fairway Utilities Series Wilson, in our humble opinion, offers the best and easiest to use set of hybrids. I am happy to report that the mission that Wilson set out to accomplish, that of developing a FYbrid family of fairway utility clubs to eradicate confusion in the long game and also to provide consistent gaps between clubs, has been accomplished more than satisfactorily. They have developed clubs that result in the same confidence and consistent results on long shots, as with short game irons. You will be amazed when you know precisely how far you hit each shot with each club. You will probably just need a combination of two to six clubs based on your ability to generate club head speed and trajectory height off fairway woods.By effectively combining fairway woods and hybrids into a single family, the FYbrid system eliminates the redundancy of more than twelve traditional clubs by offering six clubs that cover the long distance needs between the driver and six iron. The clubs set up so well, feel absolutely powerful, and when one consistently gets the ball to where it was aimed, a lower score will put a huge grin on your face! The UST V2 shaft is phenomenal and makes these clubs perform unbelievably well. Nickent continues to gain market share both on the PGA Tour, Nationwide Tour and at the retail level. The Nickent 4DX CB Combo set is great for players of all skill levels looking for considerable forgiveness and more power. The large, perimeter-weighted head features a new cavity shape that positions the away from the face for increased forgiveness on off-center hits. A moderate offset promotes right-to-left ball flight without sacrificing shot-making flexibility. The 4DX CB has a wider body and a longer shaft to match the look and feel of a fairway wood, while offering the playability benefits of a hybrid. 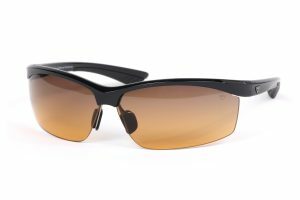 The 4DX has been injected with elastomer for a more solid and lively feel at impact, as well as having its center of gravity moved back using tungsten weights. Its head has brazed titanium and stainless steel for head stability. As with the Wilson FYbrid, a UST shaft complements this club. This club plays solid and has an extremely attractive black-green-chrome color scheme to boot. This is Callaway’s most technologically advanced game-improvement set. 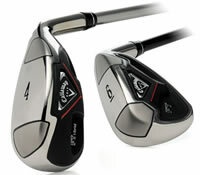 Their Fusion Technology, the superior weight-shifting science created by Callaway Golf, is incorporated in the new FT i-brid Irons set that features three hybrid-like clubs designed to replace hard-to-hit long irons and game-improvement short irons, providing the ultimate in forgiveness and playability. Multi-material construction allows weight to be shifted for optimal performance. The lightweight titanium body allows for an oversized club head with increased offset for greater forgiveness and an increased effective hitting area. Heavy Tunite weighting in the sole creates a higher moment of inertia and better stability with a low, deep center of gravity. The TPU SenSert decreases vibration and delivers solid feel. These clubs blend the control and accuracy of irons with the forgiveness, distance and versatility of hybrids. The low, deep center of gravity (CG) helps get the ball in the air quickly and easily, and the wider sole improves turf interaction. The MX-950 Hybrid Iron set is ideal for the mid to high handicap player who is looking for ease of launch, unparalleled forgiveness and maximum enjoyment on the golf course. With the MX-950 hybrid set, Mizuno utilized multiple technologies in three distinct head designs to deliver seamless game improvement performance. Hybrid 3 and 4 feature internal high density tungsten weights to create massive MOI (Moment of Inertia) values to deliver high, straight and ultra-forgiving shots, Grain Flow Forged 5 through 7 Hollow echnology irons also feature internal high density tungsten weights in the lowest and deepest area of the cavity to deliver solid, forgiving and consistent shots. Finally, Grain Flow Forged 1025E “pure select” mild carbon steel 8 through lob wedge provides pin seeking accuracy with soft, solid and consistent feel in one piece scoring irons. The MX-950 hybrid design is offered with True Temper Dynalite Gold Super Lite shafts (R300,S300) standard in steel and Mizuno’s Exsar IS2 shafts (regular, stiff) standard in graphite. Also standard on the MX-950ï will be the exclusive Mizuno/Golf Pride® M-21 58 Round grip. The suggested retail price for a set (3-PW) of MX-950 hybrids are $899.00 (steel) and $999.00 (graphite). A MX-950 gap wedge, sand wedge, and lob wedge will also be available. The MX-950 hybrid design iron set is available in right-handed models and custom shaft and grip options, as well as flat or upright lie adjustments are available through Mizuno’s Custom Club department. NIKE continues to deliver outstanding products to the marketplace and their wins on Tour are causing golfers to take notice. 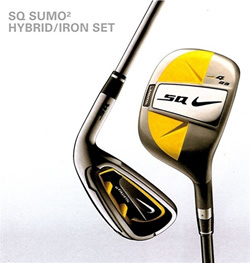 NIKE SQ SUMO2 Hybrid/Iron Geometry set consists of four high MOI hybrids and four high MOI irons combine to offer the highest total MOI in a mixed set Nike Golf has ever created. The SQ SUMO2 iron has a longer blade length, wider sole and lower profile than the SQ SUMO iron for increased stability and lower CG. New club head geometry and vibration dampening inserts bring amazing feel to the SQ SUMO² irons, while SQ SUMO² hybrids give you confident length from anywhere on the course. The Nike PowerBow design shifts weight strategically to place the CG low and deep in the irons, and to the perimeter in the hybrids, to increase MOI and create a more stable club at impact while the TPU insert dampens unwanted vibrations at impact for that pure feel. 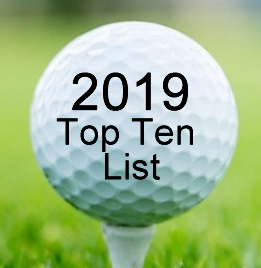 This Illinois golf company has set sales records with their products for the past few years and retailers confirm that Tour Edge offers great value for money throughout their line. 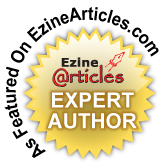 Their Exotics CB2 Hybrids, are, in this writer’s opinion. The best on the market! The hybrids and irons share the same appealing top line to deliver confidence in every club. With the QLS hybrid golfers get a shallow face, wide-sole design that has a heavy sole and lower center of gravity for higher flying, more forgiving shots. The irons combine a large undercut cavity, shallow face, and super-wide sole so shots fly higher, straighter, and land softer. 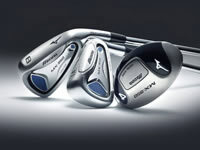 The Combo sets available with 2 or 3 hybrids usually # 3 and #4 Hybrid and 5-PW in the irons. 2,3,4,5 &6 hybrids are available. Both graphite and steel are available. 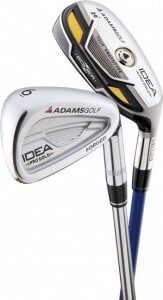 Adams is the leader of the pack when it comes to full hybrid sets offered. Their presence is ubiquitous on all Tours worldwide, especially on the Champions Tour. They make a great product. They offer three different models (Idea a30S, Idea a3 and Idea Pro) to suit the higher handicappers and pros alike. Three of the easiest-to-hit hybrids we’ve ever tested. These weapons, a.k.a. clubs, are designed with Boxer Technology which results in high MOI for more forgiveness and a straighter and longer ball flight. Three iron-like hybrids move the weight low and back for high-launching, easy to hit approach shots from the rough or fairway. Their wide sole design helps cut through turf interference allowing for more onfident and accurate swings. Cavity-back short irons with a large sweet-spot helps deliver pinpoint accuracy and better feel around the greens. Designed for the “elite” player, the Idea Pro Gold Hybrids feature an “enhanced weighting system” and a maraging steel face. The stock shaft for the Idea Pro Gold Boxer Hybrid is the Mitsubishi Rayon JAVLN FX 80-gram graphite shaft and the head cover is one the sweetest looking ones out there: it’s a gold and black striped knit sock from Rocket Tour. The stock grip is a Golf Pride DD2 in the black and yellow color scheme. The aesthetically pleasing combo Idea Pro Gold set consists of a set of 3- and 4- Idea Pro Gold hybrids and 5-PW forged cavity-backed irons. The predecessor to this combo set, the Idea Pro combo garnered great reviews. This new set is even better! The 8620 carbon steel forged head is finished with a mirror-chrome plating and features a thin top line and sole to appeal to better players. Constant offset throughout the irons offer the better player more control and workability to their ball flight. A 14% increase in groove volume gives the better golfer more accuracy and feel. An extremely popular set and brand, this eight club integrated set has great aesthetics and more importantly, forgiveness. As the name implies, the Transition set refers to the three types of clubs that make up the set: utility metals, hybrid irons and wide-sole irons. The clubs have been designed to give moderate-ball-speed players a higher level of forgiveness and playability, along with optimal launch and carry distance. And, as with the Wilson FYbrid, this set has been designed to eliminate distance gaps resulting in a higher level of consistency. 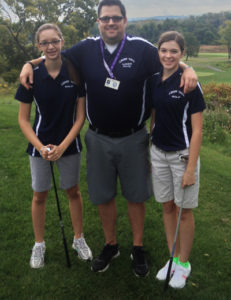 Golf can be unforgiving. But with its super-high MOI, the Transition-S set, with its 17-4 stainless head with a face insert, low-and-back center of gravity, makes for a very forgiving set of clubs. And with three types of clubs that have been integrated to eliminate distance gaps, you’re covered from anywhere on the course. The set includes 3 – PW with standard flex Aldila VS Proto-HL 65 lightweight shafts for high launch to promote increased carry distance. As has become almost standard practice in game improvement clubs like this, the lofts are set strong in the men’s version, with the pitching wedge at 44°. However, in the women’s and senior’s versions, the pitching wedge loft is 48°. And while the women’s and seniors sets are 4-PW, a 3 utility metal is available separately with 23° loft as opposed to the 20° 3 utility standard in the men’s set. wedges, are wide-soled, deep cavity back irons for maximum forgiveness and optimum launch. That’s about as perfect a set of irons as you could want or imagine. Transition S sets are available in men’s, women’s and seniors’ models with Cobra/Aldila NV-HL shafts and Cobra/Golf Pride Tour Velvet grips. Men’s sets include 3-PW. Seniors’ and Women’s sets include 4-SW.
Caveat 1: For starters, watch out for distance gaps. Just because a hybrid has the same degree of loft as the iron it might replace, it doesn’t mean it’s going to go the same distance. Odds are you’ll hit it farther – probably one club farther. However, by no means should this be a detriment to buying a set. Simple practice will determine which clubs fit your distance needs and the results will convert to lower scores. Try a nine wood or an eleven wood. You will absolutely hit it more consistently than the equivalent iron. Numerous manufacturers have the 9 and 11 woods available. These higher lofted woods are available from Golfsmith and BANG Golf. As previously mentioned, hybrid sets will save you a lot of grief over trying to match individual clubs to make up a set yourself.